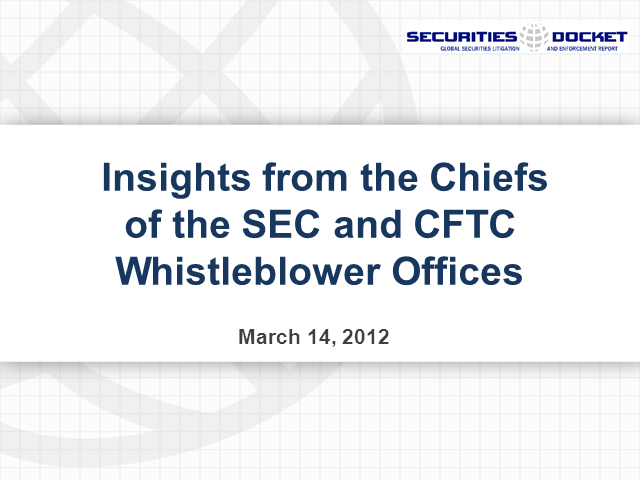 Sean McKessy and Vincente Martinez are the heads of the newly-established Whistleblower Offices at the Securities and Exchange Commission and the Commodity Futures Trading Commission, respectively. At their agencies, McKessy and Martinez lead critical, high-profile programs established under Dodd-Frank that are designed to pay awards to individuals who voluntarily provide original information about violations of the securities laws. •McKessy’s assessment of the progress of the SEC’s Whistleblower Office as he completes his first year as Chief of the Office. Please join Sean McKessy, Chief, Office of the Whistleblower; and Vincente Martinez, Director, Whistleblower Office, U. S. Commodity Futures Trading Commission, as they address these issues and your questions in a one-hour webcast.